This post is the last in a series of posts detailing my take on the Pop Box Design Project. Previously: Part 1, Part 2. Click here for the inspiration. At last, students’ prototypes were coming to life. The penultimate lesson was a (productive) mess of paper, tape, and running to other classrooms to borrow meter sticks. I wanted to give students an opportunity to share their hard work with other teachers and students, so earlier in the week, I began organizing a trade show. In terms of physical set-up, preparation was minimal; the biggest hurdle was finding volunteers for students to interact with. I sent out an email inviting other staff members to join, and ended up with about 6 staff participants; another math teacher also very kindly volunteered his Grade 11 class to join in. 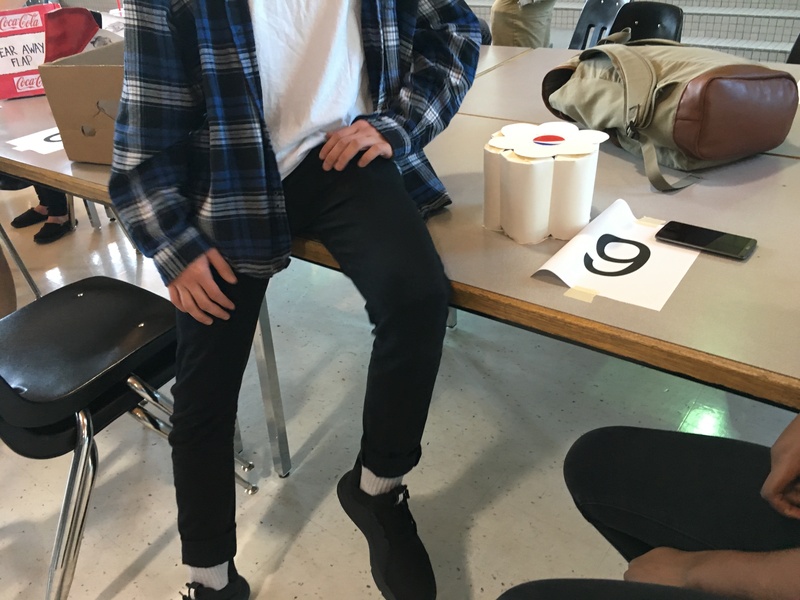 On the morning of the show, I taped large numbers on several of the tables in the cafeteria, corresponding to name tags I handed out to the student groups. After about 30 minutes of last-minute preparations (we were running a little late), the class headed down. The staff and student volunteers joined us shortly thereafter. 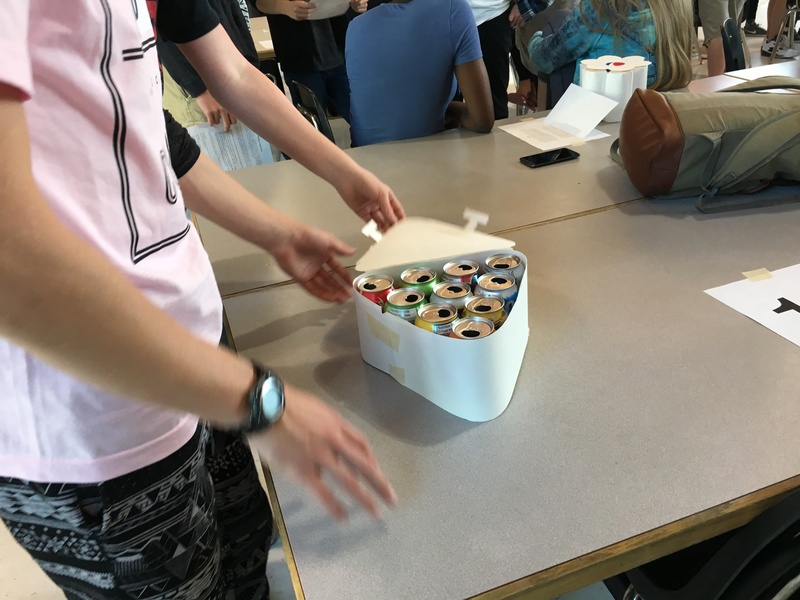 Students’ goal for this project was to design and build a prototype of a more effective and/or efficient pop box. Some groups have chosen to focus on efficiency—less cardboard, less empty space, or both—while others have chosen to focus on aesthetics, opting for a unique and interesting design. Is your design more environmentally friendly than the regular pop box design? Are these boxes easy to ship? to stack on store shelves? How will this design encourage more people to buy pop? Who do you think this design will appeal to most: kids, teenagers, adults, or another category of people? What other ideas did you entertain before deciding on this particular design? Why did you choose this design as opposed to the others? 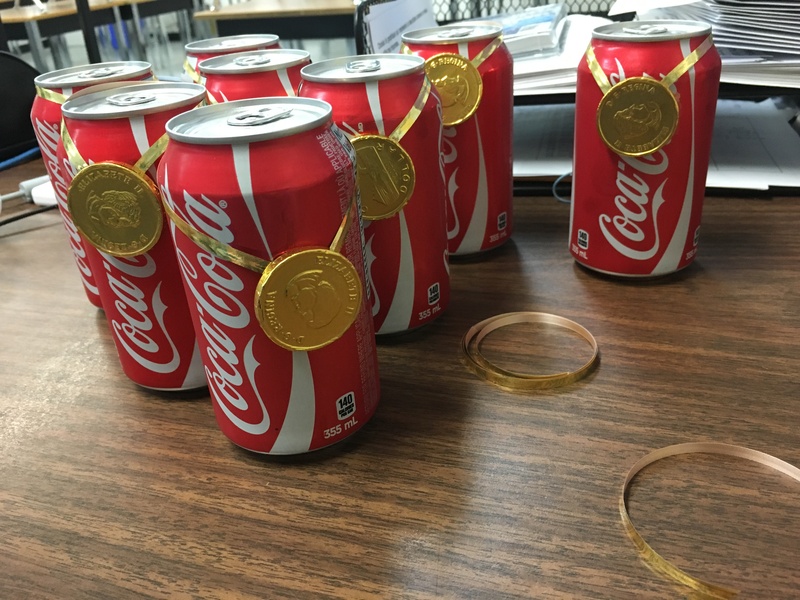 You have improved the design of the box, but have you thought about improving the design of the can? How might you do so? 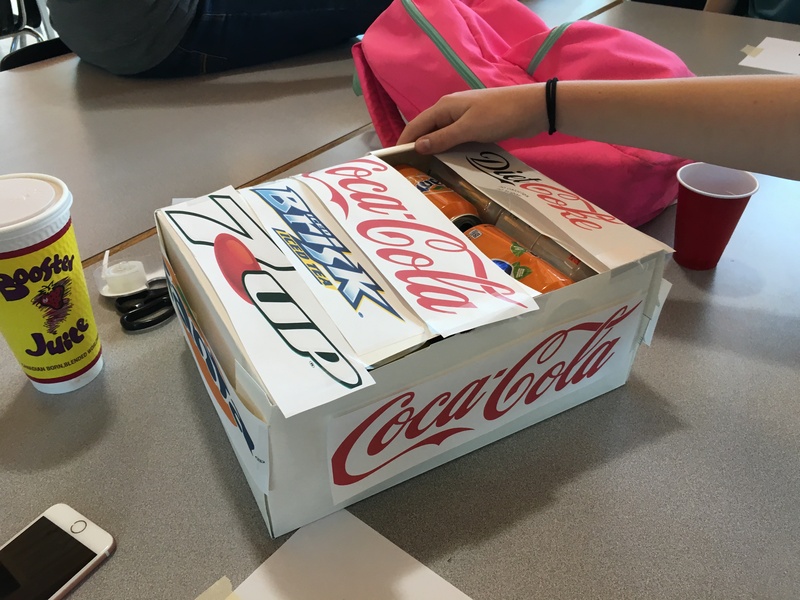 The pop box design is unique, interesting, and/or eye-catching in comparison to the standard rectangular box. The prototype is functional and has been built with care and precision. The designers present a convincing argument with regard to the efficiency and/or effectiveness of their design. Note that these grades will not contribute to students’ marks for the project. And, once everyone found their table, they were off! The sheer volume of work that went into the different designs was several times more than I could have ever gotten out of the same students with a dictated assignment. 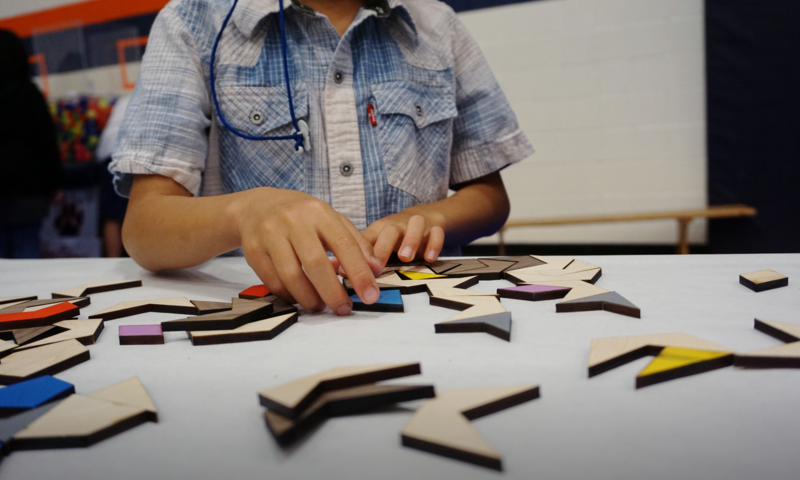 It showed me that an interesting starting point, a little bit of student control, and a willingness to learn alongside can create unbelievably powerful learning. A willingness to learn alongside was certainly critical, as I was often pushed to exercise my problem-solving skills alongside students; as such, my role shifted even further from knowledge authority to co-participant in the problem-solving process. I found this to be tremendously exciting and fun, and I hope the experience helped to validate students’ feelings of being competent, creative mathematicians. Finally, now that I’ve dipped my feet into project-based learning and survived, I am itching to explore its affordances further in other courses, with more curricular concepts. Previous posts: Part 1, Part 2.